You may be looking for Derek the Dodo or Derek, who is mentioned in Grand Theft Auto V.
Derek is a character in the 3D Universe who appears as a minor character in Grand Theft Auto: San Andreas (set in 1992). He is an employee at the petrol station in Dillimore. His voice actor is not credited. Derek, at an unknown point, became an employee at the Dillimore petrol station, working as the cashier. In 1992, in their crime spree across Red County, Carl Johnson and Catalina attempt to rob the station but are taunted by the manager, behind bullet proof glass. Johnson and Catalina then decide to steal a tanker full of petrol, with the manager and a reluctant Derek giving chase, shouting things such as "This ain't my fight..." or "That rig will crush us!". The player can choose to destroy the pursuing car, killing both Derek and the manager. If the player, however, does deliver the tanker to Mr. Whittaker at the RS Haul depot in Flint County, a cutscene will begin showing Derek losing control and crashing the car into a petrol station, although the two occupants bail out just in time to survive the explosion caused when their car crashes. The player can also kill both Derek and the manager after the completion of the mission. 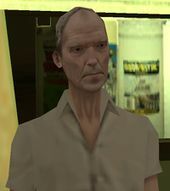 Derek does not have a unique character model and shares his design with that of a resident of San Fierro. This page was last modified on 19 November 2013, at 19:09.